What does it take to throw a great and truly unforgettable event? It takes top of the line audio visual equipment, unique decorations and backdrops and, of course, an event dance floor for your guests to get down and boogie. In order to ensure that your event stands out in the minds of your guests for years to come, why not invest in a custom, professional dance floor so that they have a clear and safe place to unwind and have some fun? Having a designated dance floor lets your guests know that it is OK to let loose a little bit and party to the music, whether it is a live performance or a DJ playing pre-recorded tunes through the audio systems. A dance floor can also break up the room, making it appear more spacious, and also ensure that the dining area is correctly distanced from the main stage. This means that guests who wish to sit down and relax can do so away from the hustle and bustle of the crowds, while those who want to have some fun can dance without being concerned about disturbing other guests. The best dance floors also feature unique non-slip high gloss overlays which reduce the chance of guests falling over – so this is definitely a design aspect to look out for. 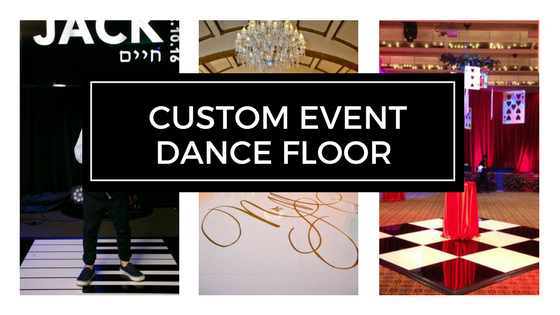 Finally, having your dance floor custom designed allows you to really make your event unique. Depending on your event, you can have your initials, your company logo or a special dance floor design to match the theme of your event. If you have decided that you would like a dance floor at your next event, it’s a good idea to talk to a professional event stylist team who can assist you with the next step. Because they have experience in moving, constructing and taking apart dance floors you can work with them confident in the knowledge that everything will be taken care of well ahead of schedule.